We have a big gig set for the 20th edition of Farm Party this weekend with five bands, and because the next day is a public holiday, you don't need to worry about drinking on a Sunday night. 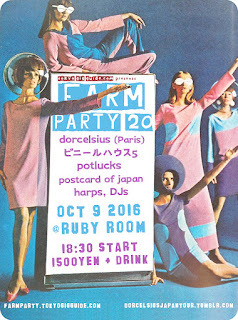 On their Japan tour, we have the French/Cambodian electronic duo dorcelsius, along with the Tokyo indie-rock/pop bands ビニールハウス5 (vinyl house 5), potlucks, postcard of japan and harps. Djing will be Gotal and Ralouf from lo-shi. It will all kick off on October 9th at 18:30 at Ruby Room in Shibuya. Entry is 1500 yen plus a drink.